Voltaire probably did not actually expire in this chair, now on display in the Musée Carnavalet, but he certainly owned it in his final years. It is listed by the museum as dating from about 1775 and having the mark of a Parisian carpenter Charles-Francois Normand. It still has the original brown wool cover (though I suspect it has recently acquired new stuffing). The unusual - and clearly customised - features are the pivoting book desk and writing table attached to the arms, the latter with a handy drawer divided into four compartments. The provenance is given as "unknown". "The apartment habitually occupied by Madame de Villette, is a sort of reliquary, dedicated to the remains of Voltaire: Her book-cases are filled with his works ; her secretaire with his MS. letters. The arm chair, which he always occupied, stands by her hearth. On the reading and writing desk, ingeniously fastened to one of its arms, he wrote for the last twenty years of his life." Lady Morgan, The Book of the boudoir, vol. 1 (1829),p.264 and France in 1829-30, p.142. Free e-book versions of these books are readily accessible. 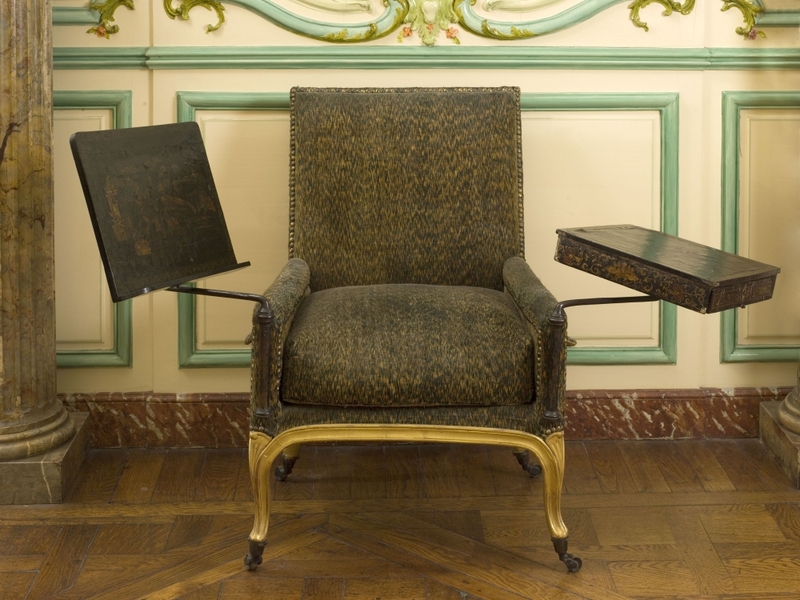 Mentions among the objects sold belonging to Voltaire, "Son Fauteuil" which made 2,000 francs.